I’ve always been a very anti-supplement minded person. I’m just not about to spend $100s on all these so called magic pills, powders, juices, etc. out there on the market that basically promise you’ll become the healthiest person on the planet if you take them. Nope, no thanks, move on to the next gullible person waiting for their miracle cure to turn their life around, I’ll be over here eating real food and at most, taking a multi-vitamin. One of the things that my nutrition coach (see more about that here) recommended recently, however, was an intra-workout protein + carbohydrate concoction (which makes complete sense if you think about it) instead of my usual water. With 15g of protein and 45g of carbohydrates prescribed, I started researching what people were using on their Facebook group to reach that level of carbs in liquid form. What I found disturbed me. Mentions of Tang, sugary lemonade powders, fruit punches, etc. made up the majority of the list and therein lies my issue with a lot of the IIFYM (if it fits your macros) movement. I’m just not willing to sacrifice ingredients to meet macro-nutrient needs. A donut may be a carb but it doesn’t mean it’s the nutritional equivalent to a sweet potato. Same thing with liquids, powdered lemonade may have the sugars that make up the right carbohydrate levels for my intra-workout drink, but I’m sure as heck not ok with putting that ingredient list in my body 6 times a week. So I’ve turned to a few healthy favorites such as tart cherry juice and my longtime friend, coconut water instead when it comes to my workout drink. Coconut water and I became bff back when I got into running. No matter how much I tried to hydrate during long training runs, I’d inevitably end up feeling like complete crap, almost in a hangover-like state from dehydration (10+ miles will do that to you). Just 10 minutes after drinking coconut water though, I’d be back to normal. I joked it was my secret miracle worker to anyone who would listen and I still swear by it today as the best natural way to re-hydrate your body. 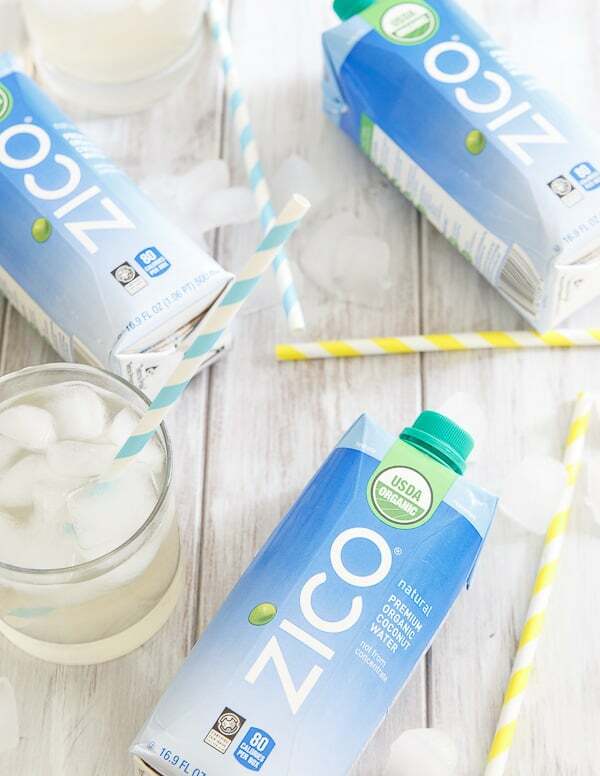 Not all coconut waters are created equal though – be sure to check the labels: I like ZICO because it has just 1 ingredient: 100% natural coconut water with no added sugar. Recently, ZICO introduced a certified orangic fair trade coconut water. As someone who cares about ingredient lists and ingredient sourcing, I was so excited to hear about this addition to their already awesome line up of coconut water (pineapple has been a long time favorite). 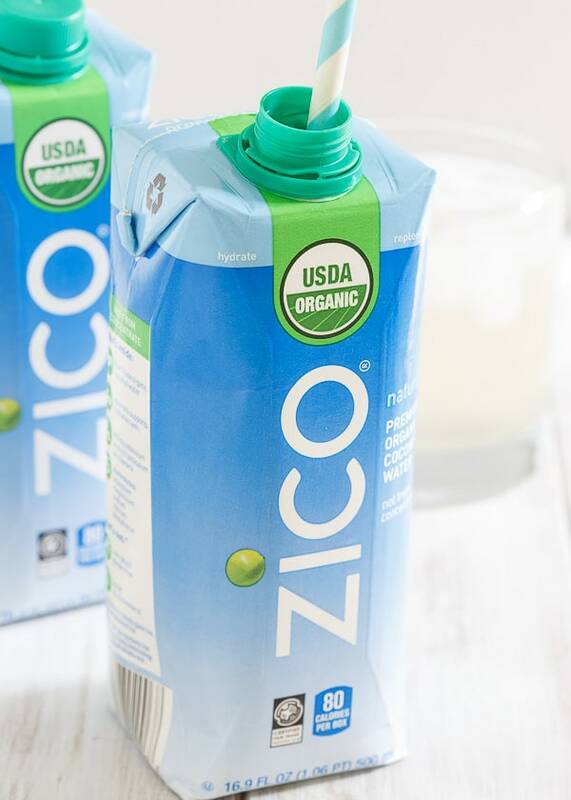 Just like their Natural coconut water, ZICO 100% Organic Coconut Water has nothing added and nothing removed. Every pack helps support fair crop prices, community development projects and the farmers and producers behind the coconut water while still bringing 5 naturally occurring electrolytes to every sip. So now you can feel even better about getting your hydration on. It’s not just the hydration factor though that it’s got going for it, coconut water is a drink we should all be consuming and here’s why. Most drinks that boast the kind of hydrating benefits of coconut water are filled with calories and excess sugars to achieve that. Coconut water is a relatively low-calorie drink at around 40 calories per 8 ounces. Everyone’s heard of eating bananas for their potassium benefits, right? Well, 1 medium banana provides about 9% of your daily potassium needs. Coconut water provides the same, if not more which is why it’s such a great option for re-hydration. Potassium is crucial to your body’s brain, nervous system and muscle strength. So when you’re just not in the mood for a banana, chug some coconut water instead. Magnesium is something almost 2/3 of us don’t get enough of in our diets. Low magnesium levels can lead to low energy levels as well as a host of other issues. Coconut water contains about 14% of your daily needs. Cytokins in coconut water have been found to have anti-ageing (who doesn’t want some of that?!) and anti-carcinogenic effects, slowing down the growth of cancerous cells. Antioxidants absorb free radicals and toxins in our bodies. Coconut water being a source of antioxidants can help neutralize the damaging effects of those free radicals. This post is sponsored by ZICO. All content and opinions are my own. My daughter and I love drinking coconut water. It really helps us here in Northern California when it is eleventy-million degrees outside! This is great info! Thanks so much. I *really* need to try to get more of my fill of coconut water! And anti-aging benefits, TOO?! Sign me up! Great info! SOLD! Sounds like there are too many benefits to ignore!!! Hmm I will try it but I really don’t like coconut related drinks. I love coconut just not the liquid taste, weird right? But I’m trying to get into shape and the benefits do sound appealing. I always end up dehydrated when I run or work out. Try one of the fruit ones then. I love the pineapple but the regular coconut water can be a bit weird by itself. And definitely drink it cold, not room temperature! Not only a thirst quencher, but also a healthy antioxidant drink! Coconut does wonders! For drinking purposes, coconuts are harvested off the trees when they are still young and green. Later, the outer green husk is removed and the coconuts are wrapped in plastic to keep the moisture. It is good for health but it can be harmful if we drink more.I love your site.